One of seven children (including a priest), Frank Morris was born in Greencastle Tyrone, but at an early age moved to Convoy, Donegal where he spent most of his life. He joined the IRA in 1942, while the 40's Campaign was in full swing. He was recruited by one of the Tyrone brigade O/c's, Eoin MacNamee, (while the latter was OTR) at a time when there were very few volunteers in the area, as the population was free from British rule, unlike their neighbors, and saw no reason to get involved. But Donegal, with its wild terrain and neutral authorities, was an important asset; and Morris, "one of the few reliable men"(1) in the area, and his knowledge of it would prove invaluable. His first noteworthy activity, he later recalled, was attending a court martial of a suspected informer. His first assignment though was to spirit volunteers across the border into the safety of co Donegal after an operation. "Carrickmore area was good to us in those days." Morris said in an oration for one of the volunteers, Jimmy Clarke. "Police cordons were extended but with the help of local people we managed to get through and make our way to Greencastle. Help was never refused by Protestant or Catholic." After he dropped the volunteers off and was returning, while approaching the Strabane bridge over the Foyle into Donegal, Morris’s car was stopped by a RUC guard. This was a routine stop and search checkpoint the RUC were increasing. Eoin MacNamee's strategy in response was to attack these whenever possible in hopes of discouraging the practice. Morris downed the guard with two shots, but he didn’t realize he had friends in the area: shots came from behind the car while another officer blocked the road with his bicycle and started firing. Seeing there was no chance of surviving a shoot out, Morris got out of the car, charged through the bushes along the riverbank and leapt into he river. Here too he faced a problem as he could not swim; for ten hours he hugged the riverbank until he was discovered after an exhaustive manhunt. while in Belfast's Crumlin Road Jail. He was dismissed from the IRA in the 50's and was recruited by fellow Tyrone republican and 40's veteran Liam Kelly into Saor Uladh. Frank Morris became an active volunteer with the group, fighting in many of its engagements. He was on Saor Uladh’s executive committee, consisting of himself, Kelly, Joe Christle, and several others. The committee functioned like a loose version of the IRA’s GHQ, directing operations and overseeing finances. He also gave the oration for Saor Uladh volunteer and Cork socialist Kevin Neville, who died in 1964. While he is speaking about Kevin, his words say something about himself as well as he found these qualities in a volunteer worth holding up for emulation: "He was a progressive revolutionary, a man who preached the doctrine of James Connolly, that the fight was useless if we merely changed flags and masters and did not change the whole social and economic system. He also believed that a revolutionary's main principle should be the achieving of his object, that his hands should not be tied by petty principles and that he should change his tactics to meet changing situations." 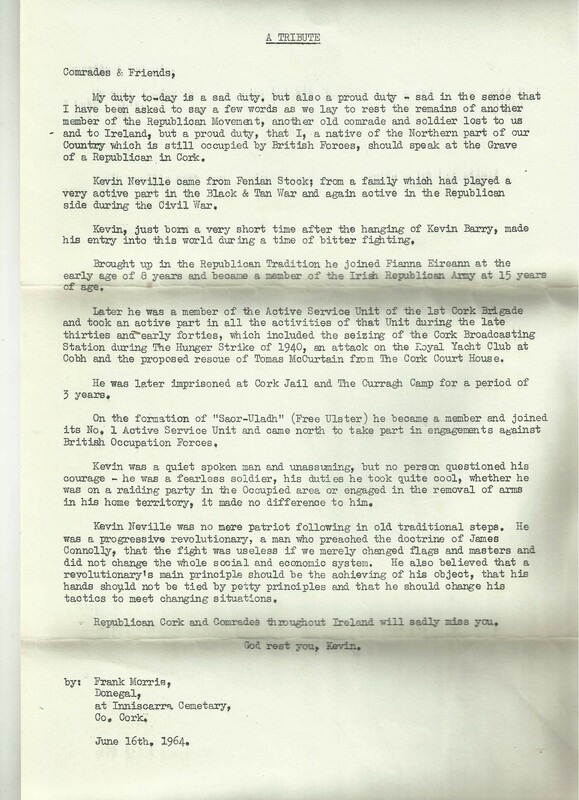 In the 60's, When Cathal Goulding called a general convention to discuss the rising situation in the north, the Army Council representative for Donegal (Ruairi O’Bradaigh thinks it was Seamus Costello)(5) blocked Morris from attending despite his long-standing contributions and repuation. Daithi O’Connell walked out in support of him. Around the same time he helped find billets for independent volunteers from Cork who went up to help defend Free Derry. After the split, he became one of the area’s first organizers for the Provisional IRA and stood on their army council. The respect he had and his influence over the PIRA can be seen in the fact that British Generals Steele and Ford contacted him in 1972 to find out where the IRA stood on certain issues. Morris replied that the IRA and British army could fight each other for years but neither by itself alone could defeat the other, adding that because of this a ceasefire should be declared. Tim Pat Coogan tried to arrange a meeting between Morris and David Hume as well. He was outed as Provisional O/c of Donegal by Martin McGuinness in 72. In the 60's he had sought nomination as a candidate for Mid Ulster but the leadership at the time considered him to be too right wing. He turned his hand to politics again in the 80's, standing as an independent candidate, but lost. 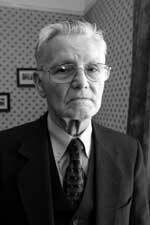 He died peacefully on June 4th, 2006 at the age of 86 after a long illness. Republicans of all shades from all over the country attended his funeral. * A writer for Saoirse (August, 1996) gives a graphic description of this punishment: "These tails were knotted and they tore the flesh from the prisoner's back. To receive this treatment the prisoner was stripped to the waist, a towel tucked into his waistband to absorb the blood and he was stretched on a "triangle", bound from the wrists and the ankles...Where the poles met at the top was a rotating wheel over which a rope was thrown. This was attached to the bound wrists of the prisoner and pulled until he was standing on tip-toe. The legs were spread apart and the ankles secured to the lower ends of two of the poles. The wielder of the "cat", whom the prisoner rarely got a glimpse of, was masked, like the executioner of old who used an axe to behead his victims on the block. The prison governor was present along with the prison doctor. The number of lashes to be inflicted was counted out, "One, Two, Three, etc", as the cat whistled through the air and descended on the unfortunate man"s back. Afterwards the prisoner was cut down and medical attention was rendered immediately to his bleeding back." 1. Tim Pat Coogan, "The IRA." 3. AP Article, "Plaque to Alo Hand Unveiled in Clones." Photo Credits: Photo of Frank, An Phoblacht. 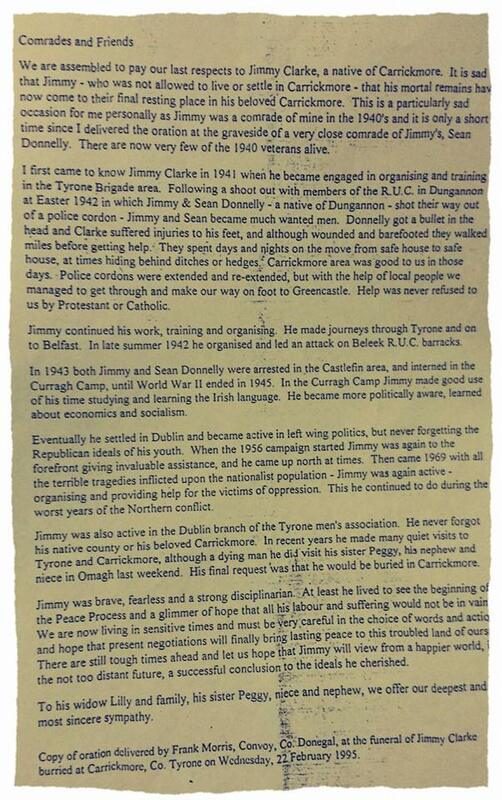 Oration for Jimmy Clarke, the Irish Republican Marxist History Project. Oration for Kevin Neville, Rebel Cork's Fighting Story.